US Vice-President Mike Pence flew to Estonia yesterday for the start of his 4-day tour of some eastern European states. Today he will meet the PM’s of Lithuania and Latvia, as well as the Estonian PM again. Despite the EU racing fast to accomplish its Military Union, it seems that the Baltic States are pragmatic enough to know that they still need America’s money and missiles. Estonia is a member state of the EU and it is also a member of NATO. 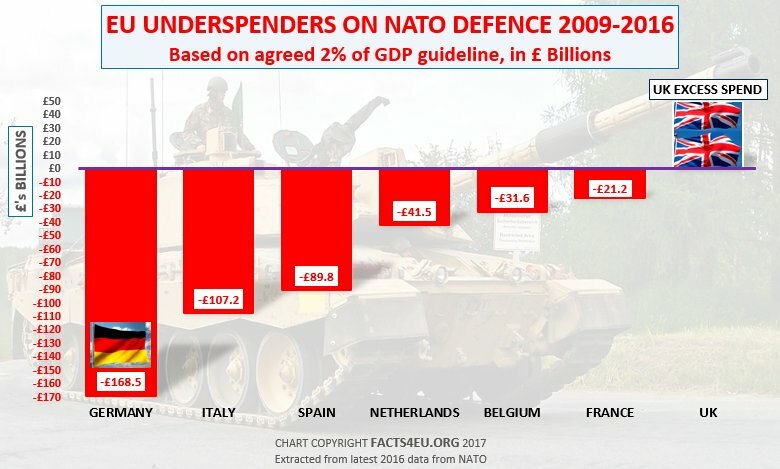 As a NATO member it is supposed to spend at least 2% of its GDP on defence. Estonia is in fact one of the very few EU countries that meets the NATO expenditure goal. Last year Estonia’s defence spending was at 2.17% of GDP, albeit that it seems to have a tendency to spend a lot on cyber rather than conventional defence forces. The picture across the rest of the EU is much bleaker. In the last 8 years the EU members who are also members of NATO have underspent by over half a trillion pounds. Conversely the UK spent over £50 billion pounds more than it was obliged to, in the same period. 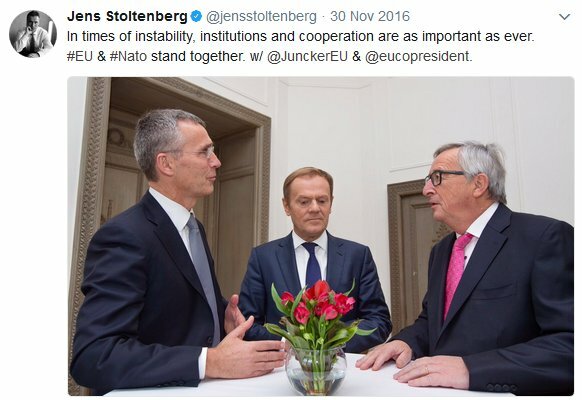 If EU countries have not even been able to fund NATO - the existing, successful, powerful organisation which has guaranteed their safety and security since soon after WWII - what chance do they have of funding a new military organisation, the EU Military Union? It is our firm view that when it comes to defence, the EU should forget its global military ambitions and focus instead on supporting NATO. The EU has quite enough of its own messes to sort out in many other areas of its activities. 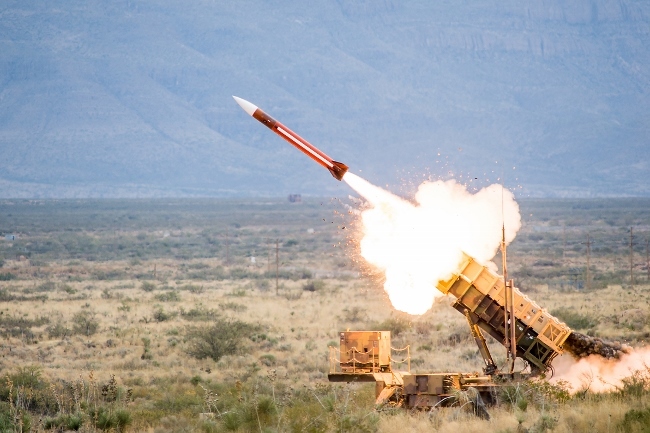 Technical note: Raytheon’s Global Patriot™ Solutions is a missile defence system consisting of radars, command-and-control technology and multiple types of interceptors, all working together to detect, identify and defeat tactical ballistic missiles, cruise missiles, drones, advanced aircraft and other threats. 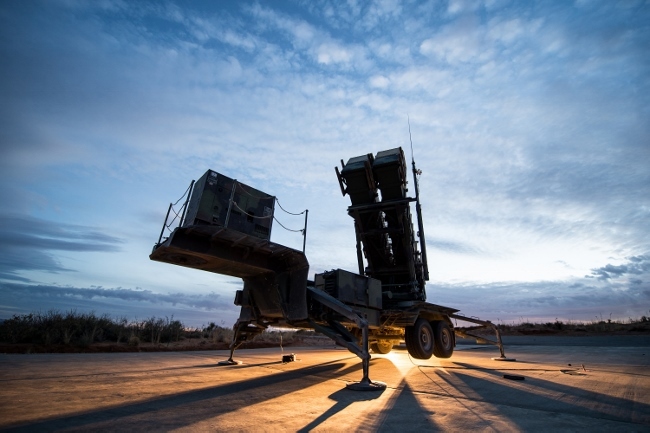 Patriot is the foundation of integrated air and missile defence for 13 nations. As ever, please feel free to send us your comments, using a pseudonym or your real name. They will appear below. Message: Brilliant graphs, thank you. It's ridiculous, the EU racing ahead with its own military structures when EU countries haven't even funded NATO properly. And it gets my goat each time I hear the EU claiming the credit for the peace since 1945! Keep up the great work Brexit Facts4EU, Rgds Tam. As president of the EU Council on the current rolling 6-month programme, Estonia’s government has released various documents which we have waded through. These relate to its priorities during the 6-month period it will be playing a leading role in EU affairs. This period will last up to 31 Dec 2017. In Estonia’s main document outlining its priorities for 01 July – 31 Dec 2017, 'Security and Defence' gets a large section. “In the field of European defence cooperation, Estonia will seek to enhance military capabilities of the European Union Member States, including determining the level of defence spending and investments of the Member States and reaching agreement on the revision of the common funding of European Union operations, notably to increase the usability of European Union Battlegroups. “Estonia supports and contributes to the discussions on Permanent Structured Cooperation (PESCO), the Coordinated Annual Review on Defence (CARD) and a European Defence Action Plan (EDAP). Estonia supports the Com-mission’s initiatives, in particular in the field of defence research and development and in strengthening the European defence industrial base in order to create better opportunities for involving and funding the small and medium size enterprises operating in the sector. Estonia’s concerns about its eastern neighbour Russia are highlighted by the military exercises which are about to start in the region. In September Russia and Belarus will conduct a series of exercises called ‘Zapad’, involving troops and equipment on a scale that will dwarf NATO’s exercise last month called Saber Strike. Those NATO exercises started in late May and lasted 4 weeks. They included Poland as well as the Baltic States and had considerable involvement from UK military forces. Whilst impressive, it’s thought that the scope of Russia’s and Belarus’ exercises will give everyone in the region cause for increased concern. 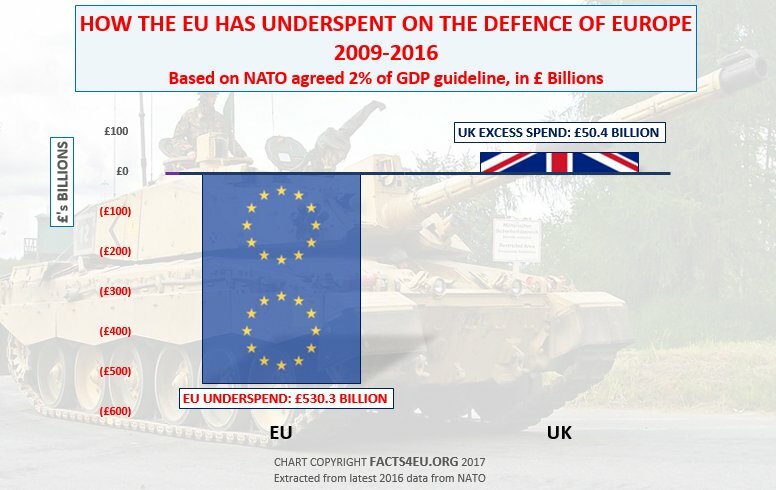 Here at Facts4EU.Org we have never stopped covering the rapid rise in the EU’s military ambitions. We’ve exposed information which the BBC and other mainstream news outlets chose not to cover. Or if they did cover it, this was done sparingly and in such a way as to make it sound innocuous. Make no mistake about it – the EU is racing towards a union of hard military power and it fully intends to replace NATO. It has set up command structures, battlegroups, laws on shared procurement, new budgets to fund its ambitions, and all of this comes under the unelected former Communist Federica Mogherini, High Representative and Vice President of the EU. Even more shockingly, the UK government has acquiesced in all of this since the Referendum, agreeing to everything and committing the UK to all manner of new EU structures, budgets, and systems. We, and the excellent folk at Veterans for Britain, are working hard to publicise what is going on and to bring it to the attention of our parliamentarians. Can you please help fund this work? We rely 100% on small voluntary contributions, which means we barely make it from one week to the next. This EU Commission video is entitled "Article 50 negotiations with the United Kingdom"
3 countries account for over half the EU’s gross receipts, one of which is the UK. Out of the 28 member states, only 9 countries make a net contribution to the EU. Germany and the UK make by far the largest net contributions. In short, British taxpayers paid for a big share of the cost of this pro-EU, anti-Brexit propaganda video. We prefer to leave it to you to express your feelings about this video. You can do so here. Message: It's outrageous the EU Commission thinks it can spend public money on a pure propaganda video against one of its own member states. It's even worse the member state is one of the few that actually pays the cost of the EU. I don't suppose it would do any good complaining but I'm going to try. I can't wait until we're out of this shambles. Roll on March 2019! Yesterday (Saturday) EU First Vice-President Frans Timmermans sent a Letter of Formal Notice to the Polish government, announcing that legal action will be taken against Poland in the next month. This legal action relates to two new laws which Poland’s government is introducing. This EU process started in January last year and has gone through many stages. Poland has shown no signs of wanting to back down in the last 18 months and it would be very surprising if it now did so. WHY IS THE EU GOING TO PROSECUTE POLAND? The Commission's key legal concern identified in the law on the organisation of ordinary courts relates to the discrimination on the basis of gender due to the introduction of a different retirement age for female judges (60 years) and male judges (65 years). This is contrary to Article 157 Treaty on the Functioning of the European Union (TFEU) and Directive 2006/54 on gender equality in employment. That is what the EU Commission says in its statement. However the issues go deeper, and relate to the Polish government's proposed changes to its laws on the appointment of judges generally, and other constitutional matters. It would be fair to say that the EU Commission dislikes the Polish government and all that it stands for. It would also be fair to say that the President of the European Commission, Donald Tusk, shares the Commission's view. Tusk is a former Polish prime minister who has been loudly criticised by the Polish government. The next most probable action by the EU is what is called the Article 7 procedure. "If the Polish government goes ahead with undermining the independence of the judiciary and the rule of law in Poland, we will have no other choice than to trigger Article 7." Like Article 50 before Brexit, Article 7 has never previously been invoked. It means that the EU can strip Poland of its voting powers in the European Council and there are further sanction mechanisms which could involve the withholding of payments. It is also perhaps worth mentioning that no citizens in the EU have previously had any idea what was in Article 50 in the case of the UK, and Article 7 in the case of Poland. All of the laws and procedures contained within the Treaties of the EU were ushered through (in some cases after being rejected by electorates of member states) without the peoples of Europe really knowing what was happening. We will not comment here on the governance of Poland, nor on the new measures that the democratically-elected government in Warsaw is proposing to enact. These are matters for the Polish people. The reason we think this story is interesting is that the EU Commission’s actions yesterday have begun a serious stage in the deterioration in the imaginary fabric of EU ‘unity’. 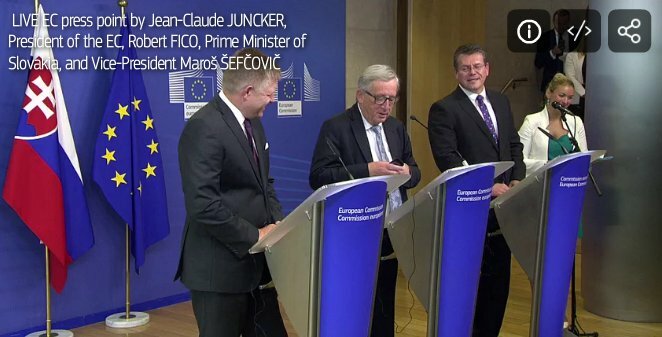 For many British people, the smug and vacuous smiles of Eurocrats over the last year have been somewhat irritating, as they have talked of how united the EU27 are. Frequently Brexit has been cited by Eurocrats like Juncker, Tusk, and Barnier as the cause of this newly rediscovered ‘unity’ and ‘solidarity’. 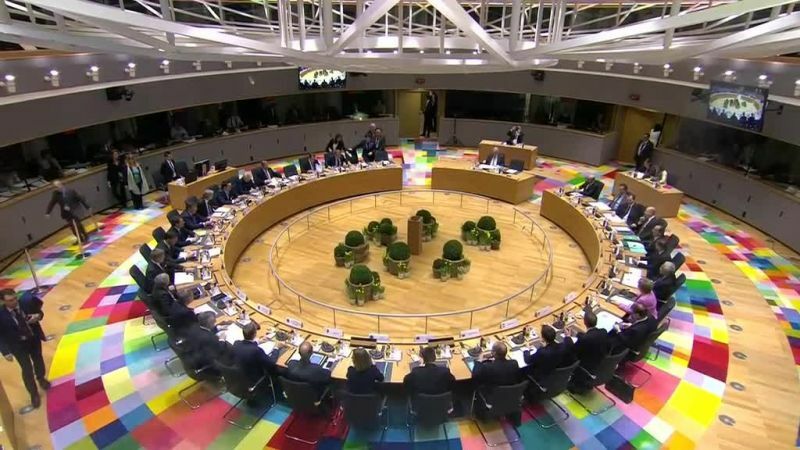 On Thursday we provided a list of just some of the fundamental splits in the EU which have been making the continental news in the last week. One of these was Poland and the possibility of legal action, which has now jumped forward in the list. With the EU Commission’s actions yesterday, on a Saturday afternoon at the end of July, that item has now gone up the agenda. There’s an old adage which exists in policing, journalism and politics: ‘follow the money’. Poland is by far the largest recipient of EU funds, having pocketed over €9 billion Euros in 2015, according to the EU's own figures. If the EU’s current actions take their course – and they show no signs of not so doing – then Poland’s supply of money from the EU could be cut. This could have an interesting impact on Brexit. Over the past couple of years Facts4EU.Org has uncovered EU funds which are ‘off-the-books’ and to which the UK is a major donor. These are additional to the ‘conventional’ annual payments which the UK makes to the EU’s budget each year and don’t appear in any totals from the ONS, the OBR, the House of Commons Library, or even ‘BBC Fact Check’ – that walking misnomer of a department. 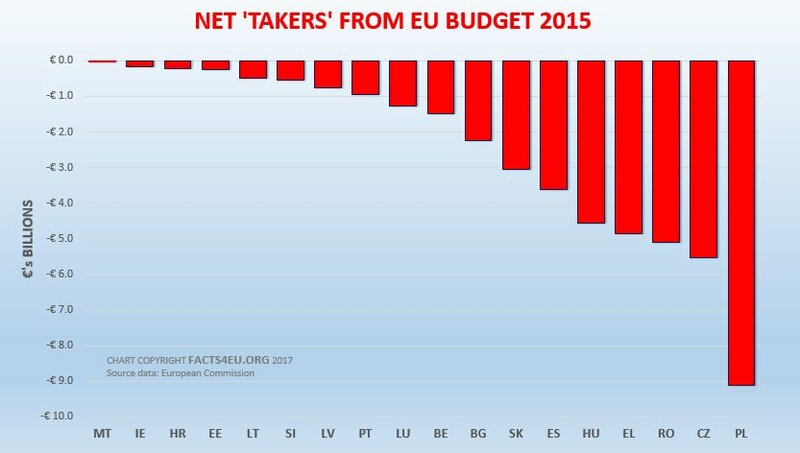 Even the conventional net budget contributions have always been understated by Remainers, but when you start adding in the ‘off-the-books’ funds too, the contribution of the UK to total EU funding each year is even greater. When the UK stops paying, the EU - and its apologists in the British Remainer community - will want to continue the pretence that the UK had not actually been paying much to the EU each year. However the simple fact is that the UK has been a major bank-roller of the EU Project for 43 years. Message: The cracks are beginning to show. The EU bureaucrats think they have a hold over the people of Europe. With their bullying tactics not only towards the British people, who have hugely funded the EU for too many years, they are now also trying to squeeze the Poles into submission. Do they really think other Europeans will stand by and allow this to happen? They have made yet another huge misjudgement. Huge unrest will result. I can see the Poles, and other nations, hitting back. These unelected officials are no longer the faceless ones. They will be held responsible for a struggling EU. 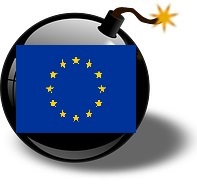 The EU Empire is falling, and failing, as all such empires have done in the past. and stalked the radio, television and print media. They did so in the knowledge that their boss Theresa May was on a three-week holiday in - of all places - Europe. They also knew that much of the country was focused on the start of the summer holidays. Inevitably, although not specifically stated by Mr Hammond, membership of the Single Market and Customs Union would continue, as would ongoing annual payments to the EU. In other words, EU nationals will continue to enter - they will just be asked to register. Her final statement was particularly interesting. She has asked for an inquiry into EU migration to assess its value, and yet “we know it has been hugely valuable”. She wants an inquiry to give her an answer which she has pre-determined. Philip Hammond (or ‘Spreadsheet Phil’ as he is known to some of his Cabinet colleagues) is and has always been an apologist for the European Union. Not known for his social IQ, Mr Hammond has not covered himself in glory since becoming Chancellor last year. His shambolic NI blunder on the self-employed immediately springs to mind, amongst other faux-pas. Mired in Establishment Remainerism, we doubt that Mr Hammond’s world is rocked by many original thoughts or that his mind is ever open to actual facts and data about the EU. Instead he pursues an ideological agenda. His approach may lack any imagination or flair, but he is dogged. It's clear he wants the UK to remain in the EU and he is doing everything he can to achieve this. 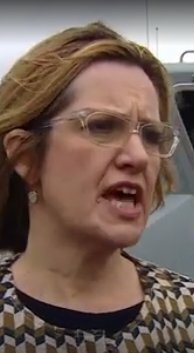 Amber Rudd campaigned vigorously for Remain last year. No-one could have described her Remainerism as being anything other than strident. Who can forget her nasty and pre-planned attack on Boris Johnson in one of the final TV debates? Truly, in Hammond’s House of Horror she is a woman possessed. It has been absolutely clear since the Referendum that Ms Rudd has not changed her views at all. 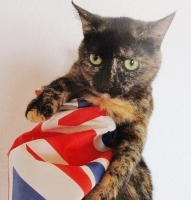 She would be happy to see the Referendum result undermined. On Thursday Ms Rudd even wrote an article for the Daily Remainer (the Financial Times, given that wonderful monika by former Tory Minister Michael Portillo) in which she laboured the value of workers from the EU and talked of the need for a ‘transition period’. In Hammond and Rudd, Mrs May has two prominent and dangerous members of the walking dead. Both these individuals will never embrace with enthusiasm the bright future ahead of us in a post-Brexit Britain. We utterly reject their views and call on Mrs May to counter what is now being put forward as the consensus Cabinet view. We do not and will not accept anything other than Brexit in 2019. Does there need to be a time-limited ‘Implementation Period’? Inevitably yes. Whatever is agreed with the EU will be last minute – the EU is incapable of working any other way - and naturally there will be disruption and the need for a temporary implementation period. However from Mar 2019 the UK must be out of the Single Market, the Customs Union, out from under the jurisdiction of the ECJ, and not paying any more annual subscriptions. It must also be able to sign trade deals globally. Should there be a ‘Transition Period’ lasting several years? Absolutely not. That is not what the people of the United Kingdom voted for and it is not what anyone would expect. It will add to disruption and uncertainty, not reduce it. The ‘transition’ arrangements promoted by the likes of Hammond and Rudd are nothing more than thinly-veiled means of keeping the UK in the EU indefinitely. The only way is out: completely out. Even if it’s a little messy at first, because of the EU’s intransigence and unreasonableness. Even if they do everything they can to punish us. Even if the UK’s Remainers squeal like vampires sighting a wooden stake descending. This Hammond House of Horrors must end. Message: What on earth are these politicians thinking of? They’ve gradually slipped this delay in without any real discussion. It seemed to be going well and now we’re heading back to remaining in, while pretending to be out. I will NEVER vote Conservative again if Hammond and Rudd get their way. In 2019 we must leave the single market and customs union and stop making annual payments and there must be no ECJ or EFTA court from 2019. Hammond and Rudd are fooling no-one. They're Remainers still and they want to keep us in via the back door. Message: Hammond said much more to the FT: UK chancellor Philip Hammond has told business leaders he wants to negotiate a simple “off-the-shelf” transition deal with Brussels to maintain current trading relations with Europe for at least two years after Brexit. Mr Hammond said he wants a “standstill” transition leaving companies with full access to the single market and customs union, followed by a further “implementation phase” while a new, UK-specific trade accord is put in place. 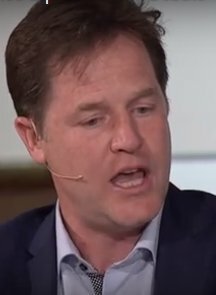 Message: In the 2017 general election, I voted for the Tories to ensure that we get the best Brexit, thus if the Conservatives fail to get us out of the EU by 2019 and effectively stitch us up with a likely never-ending transition period to please the Remoaners like Rudd and Hammond, like many people who support democracy and the will of people, I will not vote for the Conservatives in the GE 2022. I voted for Brexit, not for the UK to stall in a 'transition period' when we are almost out the door. I don't think our businesses will like the extra uncertainty of a transition period, opposite to what Hammond and Rudd thinks. TO FACTS4EU.ORG LIKE I DID"
is something you will probably never hear this woman say, alas. 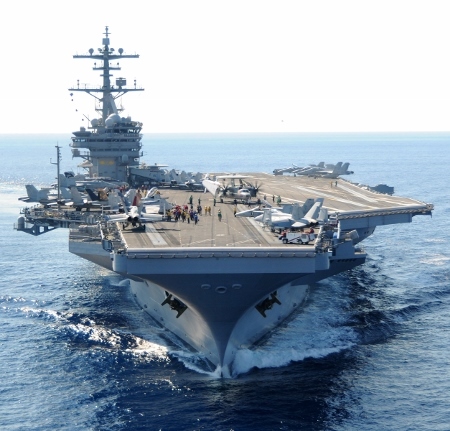 The US Nimitz-class aircraft carrier the USS George HW Bush together with its accompanying carrier fleet supplied by Britain and other NATO countries will start Exercise Saxon Warrior on Monday. 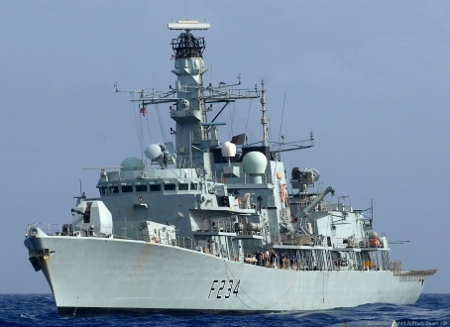 This NATO exercise on the EU's doorstep is designed to give the Royal Navy's strike team valuable experience ahead of the deployment of its two new aircraft carriers, the HMS Queen Elizabeth and the HMS Prince of Wales. 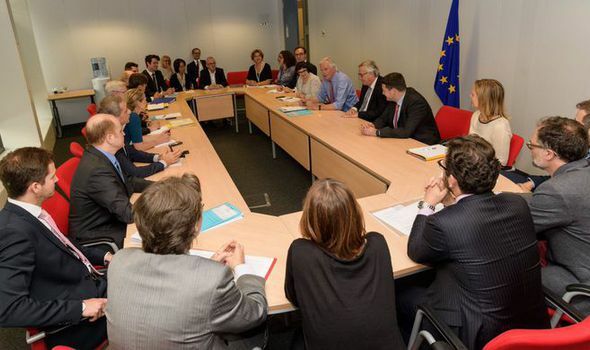 Well done to Nick Gutteridge, the Express' man in Brussels, for uncovering this photo of Michel Barnier, Chief Brexit Negotiator for the EU27, and his TF50 team meeting President Juncker in the bowels of the Berlaymont building yesterday. We've now nicknamed this overcrowded room 'the Juncker Bunker', given the bunker mentality which appears to be slowly descending on the EU Commission now that it's clear the UK is not going to roll over on what the EU considers to be red-line issues. Elsewhere in Brussels yesterday Michel Barnier told a meeting of the EU ambassadors that UK-EU trade talks are unlikely to start in October, as not enough progress is being made on the EU's first priorities - the most important for the EU being the financial settlement. Changes are being made in government departments over the way in which communications is handled. This has been imperative for many months, during which time the EU has easily won the PR battle. Readers may wonder at our slightly militaristic headline this morning. We make no apologies for our gradual attempts to redress the balance of reporting in the UK, where so many young journalists and TV presenters have been brought up on a diet of 'Bad little Britain' education. The United Kingdom is a much more powerful and important beast on the world stage than much of our news media know or understand. We feel it should be part of our public service remit to make this clearer to those educated to believe that Britons should be ashamed of their past, and that the EU is automatically right whenever it criticises the UK. Message: Britain still has to balance its relationship with America and the EU. For example, America rather wants us in NATO whilst the EU wants us to be its future army. The EU are not our allies and never have been, rather we have been used as their piggy bank for their big projects and their big pay packets. The USA are actually one of many allies that Britain has outside the EU, our other closest allies are the Commonwealth Realms of Canada, Australia and New Zealand. After leaving the EU, The United Kingdom should consider making the Commonwealth into a free trade block to allow easier trading between like-minded countries. Perhaps also at border control at UK airports where there is currently a special section for EU/EEA passport holders, we should change it for Commonwealth passport holders instead, so that the people of the Commonwealth are able to get the benefits of quicker passport control. This morning EU Commission President Jean-Claude Juncker held a live, televised press conference. 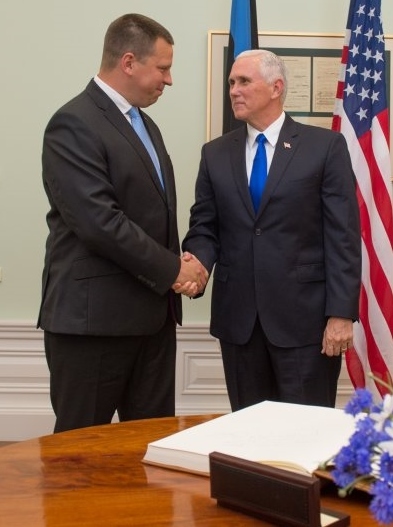 It was with the Prime Minister of Slovakia, Robert Fico, who is also the current head of the 4 ‘Visegrad’ countries – Poland, Hungary, Slovakia and the Czech Republic. Perhaps Frau Merkel had been listening to the press conference and wanted to give President Juncker some further instructions to correct what he had said. Perhaps she wasn’t aware that he was actually in the middle of a press conference. If so, it’s remarkable that she doesn’t have her staff check to see if President Juncker can take her call before making it. Whichever is true, one thing has always been clear. Frau Merkel calls the shots in the EU. Below are Foreign Secretary Boris Johnson and Defence Secretary Michael Fallon in Australia for the annual meeting of UK and Australian Foreign and Defence Ministers. This photo was taken during the night, UK time, and opposite the British party is Australian Minister for Foreign Affairs Julie Bishop. The Secretaries of State are discussing the future of Europe, regional security and defence, East Asia, terrorism and promoting our common values. One of the major spin-off benefits of Brexit for many people in both the United Kingdom and in Australia and other Commonwealth countries is the opportunity to build even stronger relations going forward. We will be writing more about these opportunities in the coming months. The EU has been crowing for the last year about how ‘unified’ it is, and how the EU27 are acting in complete ‘solidarity’. Unity and Solidarity have been the buzzwords of the EU since Brexit. 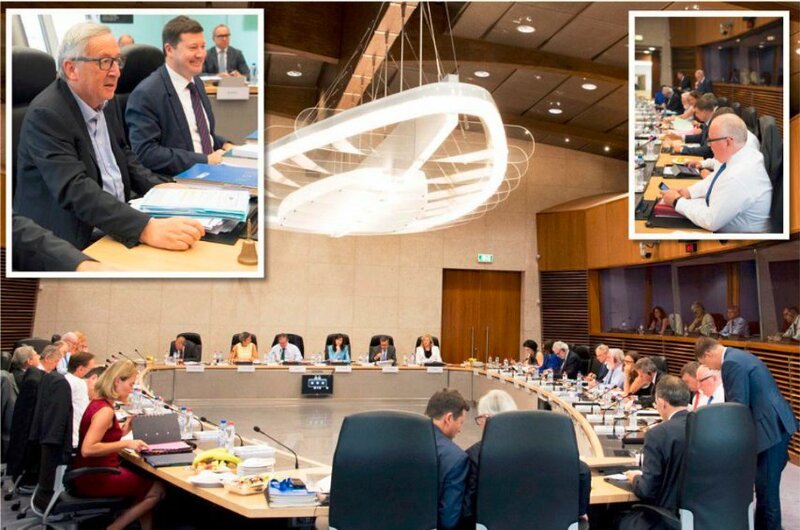 Yesterday the EU Commissioners had their regular weekly get-together in Brussels. We can’t imagine that it was a happy and uplifting experience for them. The above are just some of the disputes which have been in the headlines in Europe in the last day or so. 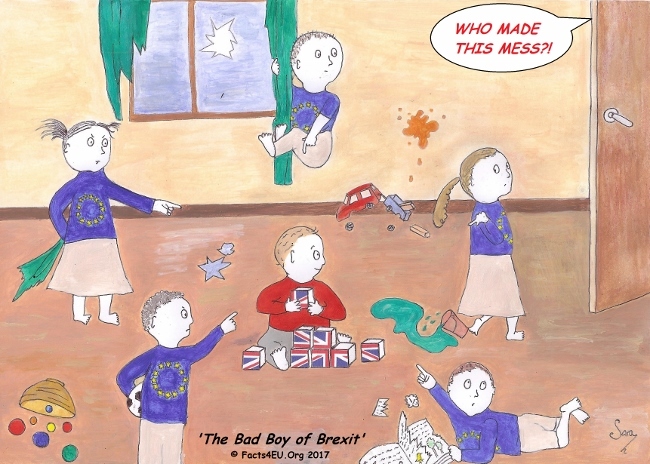 We are not for one moment suggesting that this represents a falling-apart of the EU, merely that the EU27 are not the warm, loving family they are portraying themselves as. We expose the UK's veterinary profession and its pro-EU stance on recruitment, pet health, and food hygiene. We're still working on this exclusive Facts4EU.Org exposé. Can you help us to fund the research and report? Yesterday the EU published its 2017 ‘Consumer Conditions Scoreboard’. In essence this survey looks at the consumer experience – what it’s like buying goods and services in each country of the EU. This 2017 report had a focus on the online world. Below we show some interesting summary information that we’ve extracted from it, starting with the online commerce world and moving onto the consumer experience generally. Looking at consumer issues generally, as opposed to online experiences only, the UK comes out at the top or very near the top of most of the main areas of study in the report. The United Kingdom scores first in consumer trust in organizations, in retailers and service providers, in NGOs and in ADR. Consumer trust in redress mechanisms and in courts in the United Kingdom are the second highest in the EU-28. Consumer trust in public authorities in the United Kingdom is the third highest in the EU-28. Consumers in the United Kingdom have the EU’s highest trust in product safety and the EU’s second highest trust in environmental claims. 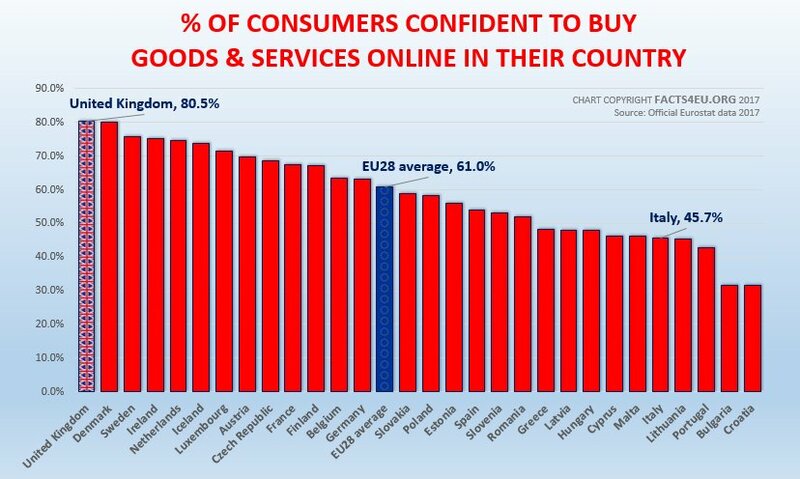 Confidence in online shopping is the highest in the United Kingdom among the EU-28 countries. 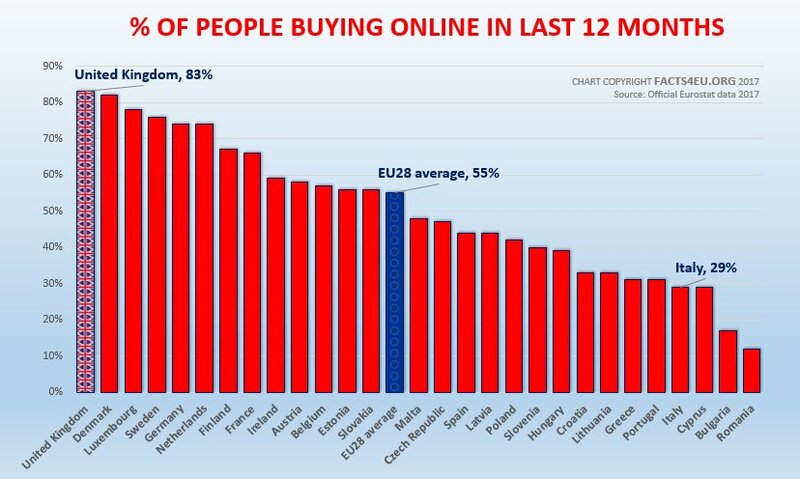 United Kingdom has highest online sales in the EU-28. United Kingdom has the EU’s second highest score on the compliance and enforcement composite indicator. Consumers in the United Kingdom are the least exposed to other illicit practices from domestic retailers in EU-28. Retailers in the United Kingdom are the second most likely in the EU to think their domestic competitors comply with consumer and product safety legislations. Overall the report shows just how futile it is for the EU to try to treat every citizen of every country the same. EU countries are different and are at different stages of development, and the behaviour of the peoples of those countries reflect this. In many ways this EU report shows up what the EU elites are interested in – the homogenisation of European cultures so that we all lead exactly the same lives. Any attempt to ram the various odd-shaped peoples of the EU into standard EU round-shaped holes is doomed to failure. Nevertheless the EU elites have spent decades trying to do this as quickly as they can. Sometimes they go too far too fast and people rebel, as they did in the UK’s EU referendum last year. When this happens the Eurocrats retreat a little and ‘rebrand’, before carrying on down the same path. That is what is currently happening with the ‘5 options’ future plans which we reported on recently. The Eurocrat mindset is so fixed that no attempt at reforming the EU will ever be possible. Only a ‘start again’ approach will ever work. If the peoples of other countries wish to follow a different path from the centralising Eurocratic elites, they will have to do what the people of the UK did and vote to leave. Of course this assumes that their own political elites will give them a referendum. Right now there is little appetite for other exits across the EU. Certainly when a large proportion of the EU countries are recipients of the generosity of a small proportion of wealthier members, all those poorer countries would be mad to turn off the tap of money. Gradually, however, this will change and in a later piece we will write about what could happen. 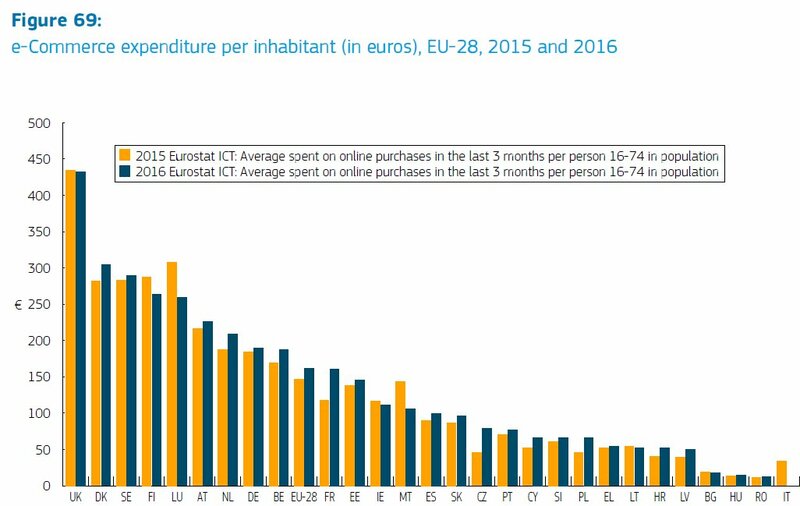 For now, we will leave you to wonder how the UK became part of a political union which has countries whose inhabitants’ online spending is one-fortieth of that of the UK’s inhabitants. Online buying isn’t the most important thing in life, but it’s one of many reasonable indicators of widely-different lifestyles. We could equally well ask how it is that some farming in EU countries is still done by horse and cart. [ Sources: EU Commission | Eurostat ] Journalists and politicians can contact us for the full list of links, as usual. 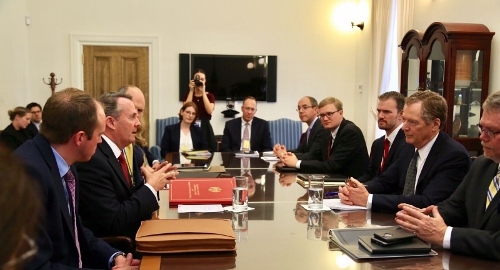 The UK’s International Trade Secretary, Dr Liam Fox, has been busy for the last two days in the US, representing British interests pre and post-Brexit. Yesterday Dr Fox made a speech at the American Enterprise Institute. The transcript is here but you may prefer to watch it below. When did we become such a nation of pessimists? Britain launched the first of its two new aircraft carriers recently, for sea trials. All that large parts of the press could do was criticise and say that the new fighter jets for the ship weren’t yet ready. The new ship is a triumph of British engineering and defence technologies. Yesterday the UK’s International Trade Secretary, Dr Liam Fox was batting for Brexit Britain and doing a fine job from what we’ve read in the American media. As he points out in his speech above, some of the British media seem more obsessed with a detail of chlorine-washed chickens. Chickens may be an important detail in the agricultural part of trade negotiations in the long run, but what matters right now is that the US is keen to do a trade deal with us. On the other side of the World, the Foreign Secretary has been busy making friends in New Zealand. Yesterday he met the NZ Foreign and Trade Secretary, as well as the NZ Prime Minister. The mood music was all very positive. The Duke and Duchess of Cambridge just completed a very successful visit to Germany. Since then we’ve been treated to a succession of stories about how German industry cares more about EU27 political unity than it does about continued trade with the UK. The simple fact is that since Brexit the United Kingdom has become a good news story worldwide, despite poor PR from government departments for so long. Things seem to be changing and we’re happy to share this with you. [ Sources: Dept for International Trade | Foreign & Commonwealth Office | American Enterprise Institute | British High Commission New Zealand | HMS Queen Elizabeth ] Journalists and politicians can contact us for the full list of links, as usual. We expose the veterinary profession, its pro-EU elite, and the lies you will soon be told about the pet health and food hygiene industries. This affects the 23 million sheep, 9.8 million cattle and 4.4 million pigs in the UK, as well as the 16m pet owners and every meat-eater in the country. You will not see this anywhere else. Don't miss it! Can you help us to fund this research and report? UKIP MEP and Agriculture Spokesman, Stuart Agnew, was allowed a rare opportunity by the BBC to give a Brexiteer’s views on Michel Barnier’s comments following the latest Brexit negotiations last week. In the 3 minutes he was on TV, Mr Agnew made an impression. The BBC man raised the question of the tone of the language being used by Mr Agnew (“down on their knees”) and by the Foreign Secretary (“whistling for their money”). Christian Fraser suggested that this kind of language is not helpful, and this is certainly a familiar refrain from all Remainers when – rarely – terms like these are used by Brexiteers. In fact these Remainers should try working in Brussels, as Mr Agnew does. They should try sitting through the interminable committees and plenary sessions of the European Parliament, and hearing the nonsense on offer every day. Remainers could even try going through as much EU material as we do on a daily basis. Then maybe they might understand the sheer frustration engendered by exposure to EU-babble. They might also learn a thing or two, and maybe they might even start to realise that the European Union that they think exists, does so only in their imaginations. We defy any rational British person with a ‘normal’ job, to spend a week working in Brussels – at the EU Commission or parliament – and not come back reeling from the illogicality and insanity of it all. Eurocrats and Euro-politicians simply don’t live in the real world. Some of the craziness from the EU is so crazy that the only effective way to combat it is by being as 'un-English' as possible. We completely understand why Stuart Agnew was direct in his language. He has learnt that if you are polite in the face of patent absurdities, the person uttering them will never realise how ridiculous their views really are. Naturally we generalise just as Mr Agnew did last week, but that’s because he and we have to make quick and simple points. We live and work in a world dominated by Remainer opinions being seen and heard on the television to the detriment of all else. It can often be difficult to get through to the public with the reality. Thank goodness for the internet. [ Sources: BBC ] Journalists and politicians can contact us for the full list of links, as usual. At the end of the first quarter of 2017, the government debt to GDP ratio in the Eurozone stood at 89.5%, a worsening compared to the end of the fourth quarter of 2016. This is according to data released last week by Eurostat, the statistical office of the European Union, and analysed by Facts4EU.Org. The highest ratios of government debt to GDP at the end of the first quarter of 2017 were recorded in Greece (176.2%), Italy (134.7%), and Portugal (130.5%). Compared with the fourth quarter of 2016, the worst performers in the last three months were the Czech Republic (+3.1 percentage points – pp), Luxembourg (+3.0 pp), Croatia (+2.6 pp) and France (+2.3 pp). Conversely, and ‘despite Brexit’, the UK’s ratio improved by -1.3 percentage points. The EU’s statistical office doesn’t record its feelings about the performance of its home base (and home of the EU Commission). Unfortunately the ratio in Belgium is an unhealthy 107.7%. That’s worse than in the previous quarter and 19.7 percentage points higher (worse) than the UK. 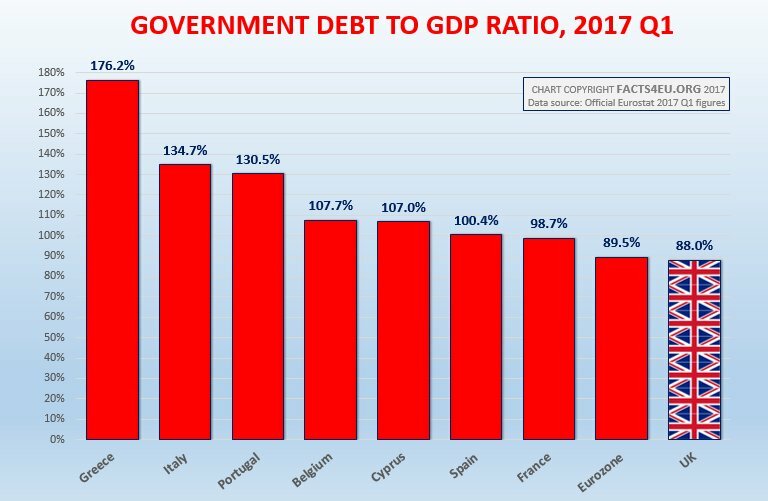 Sadly, neither does Eurostat explain how it is that the UK - the bad boy of the EU and a country which by now should be on its knees financially - saw an improvement in its ratio of government debt to GDP in these latest figures. Let’s just say that again for any Remoaners who may be listening: ‘The Brexit Kids Done Good’. Macro-economic data is produced all the time and it goes up and down. The main thing to draw from the data since the UK voted to leave the EU is that Brexit has not resulted in the immediate economic car crash confidently threatened by Messrs Osborne, Cameron, and their friends in the entire British and international Establishment. The vast majority of economic news in the last year has been positive, despite the concerted and repeated attempts by so many commentators (not least at the BBC) to suggest otherwise. Now there’s nice thought to enjoy on a summer Sunday in our great country. [ Sources: Eurostat ] Journalists and politicians can contact us for the full list of links, as usual. Following the second round of Brexit negotiations last week, the combined UK-EU Working Group on citizens’ rights was the only one to produce a paper showing each side’s positions on all the key elements of any future agreement between the UK and the EU27. You can download the document here, but for those with limited time we have prepared a screenshot which demonstrates the amount of disagreement between the two sides. If this were a business negotiation, we would hone in on the red issues to see if there were any way a deal was going to be done. If it rapidly became clear that no deal was possible, this would save a great deal of wasted time on minor issues. The biggest red issue on citizens’ rights is the EU’s demand for jurisdiction of the CJEU (European Court of Justice). It is - and always will be - unacceptable to have any EU court or similar body exercising judicial power in the United Kingdom. The British people voted to leave the European Union, meaning the United Kingdom will once again become an independent and sovereign nation, like the vast majority of the 200-odd countries around the World. For the EU as a foreign power to demand to exercise any judicial authority in the UK’s affairs is wholly unacceptable and is not something on which compromise is possible. For the avoidance of doubt, this also excludes any idea of a quasi-EU body such as the EFTA court or similar having any role. EU citizens living in the UK should be perfectly happy to be governed under UK law, just like the citizens of the UK itself. There can not – and should not – be two laws operating in the UK. The UK government needs to make this point very loudly and very clearly, so that negotiations can then proceed with the EU being fully aware that this is the case. [ Sources: DExEU | EU Commission ] Journalists and politicians can contact us for the full list of links, as usual. Message: I would go further than this. The EU citizens rights no longer exist after March 2019 when the UK becomes a non-EU member state. All rights given to them (whether equivalent or not) would be enshrined in UK Law and need to be regulated by UK Law. The ECJ should have no involvement whatsoever. The House of Lords Select Committee on the European Union travelled to Brussels last week, to take evidence from the EU's Chief Brexit Negotiator Michel Barnier and some of his colleagues. The evidence was published yesterday. Below are three key points, and you can read the full transcript here. “If you say 12% to 14% and I say 15%, we can discuss it, can we not?” asks Barnier. WHO ARE THESE UNELECTED PEERS? Baroness Kishwer Falkner: Born and raised in Pakistan, Kishwer Falkner worked for the Lib Dems in the House of Commons and at Party HQ. She became Baroness Falkner of Margravine in 2004, having been appointed by Lib Dem leader Charles Kennedy. 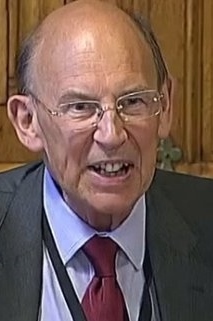 Baron Robin Teverson: Lord Teverson was a Lib Dem MEP who lost his seat in 1999. 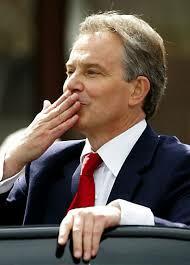 In 2006 he was appointed a Baron by Charles Kennedy. He currently chairs the Lords Select Committee on the European Union. The other four members of the Lords Committee who travelled to Brussels were Lord Crisp, the Earl of Kinnoull, Baroness Suttie, and Lord Woolmer of Leeds. They were equally pro-EU in their discussions with Michel Barnier. These Europhiliac peers should be ashamed of themselves. They quite clearly support the EU over the interests of their own country. Frankly it was nauseating having to read their sycophantic twaddle as they verbally genuflected before Michel Barnier. Despite failing to come up with any legal justification for the UK to make a ‘single financial settlement’ to the EU on Brexit, they nevertheless are strong proponents of the UK paying a large Brexit Bill. During the course of M.Barnier's testimony, it was clear that these peers would work in any way possible to secure the best possible deal for the EU, not the UK. It is our opinion that if these peers of the realm feel the way they do about their country, and if they feel that the European Union is a superior culture and government, then they should immediately apply for Belgian citizenship and start househunting in Brussels. [ Sources: Houses of Parliament ] Journalists and politicians can contact us for the full list of links, as usual. Message: Just how many reasons do we have to have before the House of Lords is consigned to the dustbin? Message: Its a fallacy that the UK no longer has the death penalty. In fact the death penalty still exists for the crime of treason, hence the lack of prosecutions by the CPS of jihadists returning to the UK because the Crown knows that a guilty verdict would lead to a sentence of death which the public would demand be carried out. All MP's, Lords and other ministers etc, who act against the will of the people are in fact committing acts of treason against the Crown (as Her Majesty is the guardian of the will of the people), and as such should be charged with treason and if found guilty taken out and publicly hanged. These people deserve no pity or mercy and in the very least should have all of their wealth and assets derived from employment with the Crown confiscated. Message: Sorry John Nolan, but you are wrong. Until 1998 the sentence for High Treason (Treason Act 1351) was indeed death. 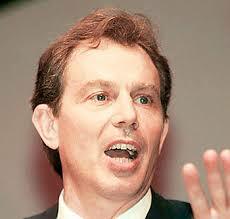 However, that was abolished in 1998 so Blair could sign Protocol 13 (I think it is) of the ECHR. The last working gallows at Wandsworth Prison were demolished. Message: These particular Members of the House of Lords have no business trying to influence the negotiations. They are unelected and only have one vote, the same as the rest of us. The current EU negotiations are being conducted by the elected representatives of the British Government, in accordance with the majority Referendum vote to leave the EU. These Lords have no legitimate mandate to interfere. As they obviously like the EU way of doing things, undemocratically, perhaps they should give up their rights to a British passport and move to Brussels immediately. Their persistent whining, just because they did not get their own way, could well lead to calls for the dismemberment of the House of Lords. Message: It sounds like things are getting explosif in the Assemblee hommes as well as the Commission's. We can't say M. Barnier didn't warn us. Stay well away and sign no cheques. If the Lib Dems in the House of Cronies want to chip in personally, they are welcome. French economy minister issues bizarre red-line demand to UK. The French economy and finance minister (the equivalent of the UK’s Chancellor of the Exchequer) is Bruno Le Maire. Yesterday he was giving evidence to the Economic Affairs Committee of the Assemblee Nationale, the French parliament, when he made his extraordinary statements. 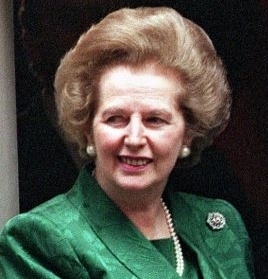 This was a rather clumsy reference to Margaret Thatcher’s fight to secure a rebate from the UK’s very high annual payments to the EU in the 1980s. 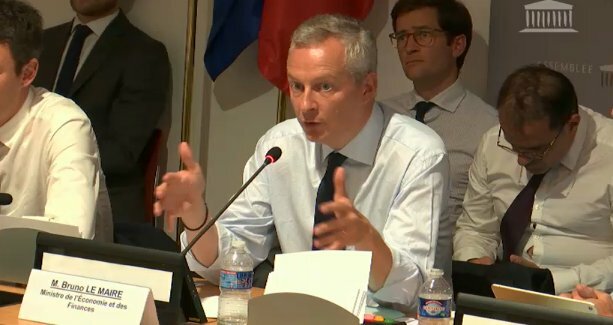 Earlier in the session, M. Le Maire talked about France and Germany making quick strides towards economic union, which we will report on tomorrow. It remains the case that the EU has been unable to come up with any legal justification whatsoever for its demand that the UK make a ‘single financial settlement’ to the EU, on Brexit. For the EU to want money to help to get itself out of a hole is quite understandable. After all, the UK has been bankrolling the EU every year and the EU27 will certainly miss the UK’s largesse. However, wanting money and being owed money are two different things. Given that there is no legal justification at all for the EU’s strange demands, we take a similar view to that of the Foreign Secretary regarding the suggestion of the EU whistling for it. Mr Barnier may hear the sound of a clock ticking. We hear the sound of a desperate organisation on its uppers, clutching at absurd arguments which the rest of the world will find bizarre. Message: Perhaps we could present them with our invoice for rescuing them in WW11 up to to the day we walk out of the EU? Message: These demands are the demands of the desperate. The French politicians know that after Brexit their fishing and agriculture industry will be virtually destroyed and many farmers and fishermen will go bankrupt. This in turn will cause mayhem within France and the French government's promises to the French population about how well they will protect them and how they do not need UK or UK markets etc will be clearly shown to be bunkum. They fear this discord and wish to blame the UK for the crash of these industries just like they sought to blame the UK for deserting them at Dunkirk. It's a great excuse with theatre. Not a day goes by without the fundamental nature of the decision of the British people to leave the EU being questioned in some way. When former Prime Ministers talk of needing a second referendum to correct the mistake of the first, and when the enactment of the majority decision is referred to as ‘the tyranny of the majority’, it is clear that we mustn't stop fighting. speaking to the New Statesman. 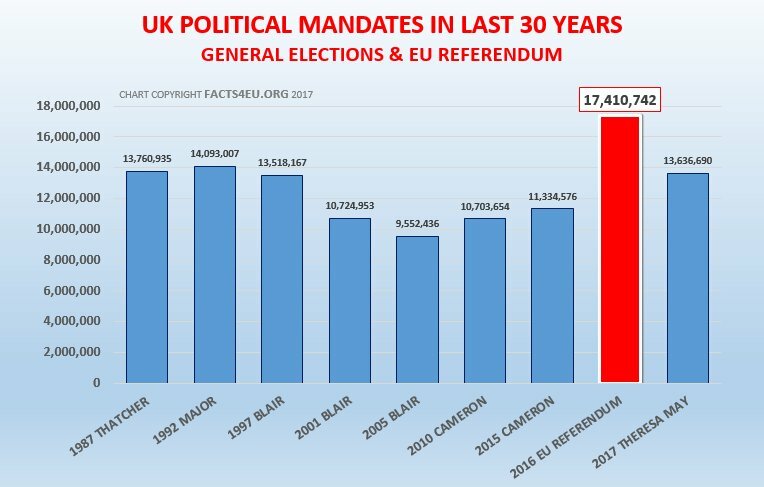 3.3 million more voters voted for Brexit, than for any government in the last 30 years. It was the single biggest mandate in the UK, ever, for anything. The message to the Establishment is simple: You lost. Now get over it and get behind your country as it negotiates its way to a bright new future in the World. Below is a reminder of what a decisive mandate looks like. Regular readers know that we cover the full range of issues in relation to Brexit. In the last month we've written more stories than usual about defence. A reader emailed to request that we produce a summary of links to recent defence pieces and we're happy to oblige below. 16 Jul: Pt 1 - When did the government sign us up for this? Regular readers know that we cover the full range of issues in relation to Brexit. However in the last month we've written more stories than usual about defence. We've done this principally because the British public are not being informed of what's being done in their name. The issues are complex and regrettably they are almost never covered on the TV news - which remains the principal source of news for most Britons. We hope you've found the articles useful. Your comments are welcome, as always. How? UK companies are tied into defence procurement deals which require adherence to EU defence policy and European Defence Agency (EDA) membership. 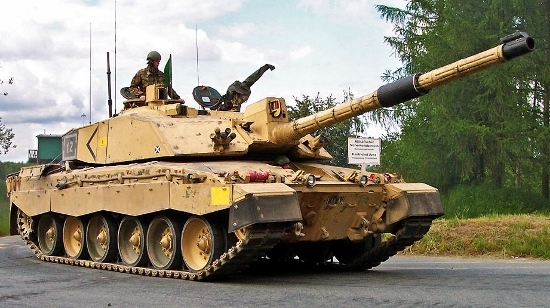 When the UK leaves these, it regains defence autonomy. But the companies will be hostages to EU policy and political pressure from Brussels. How? The agreements are an additional set of UK commitments. These will be harder to unravel post-2019. They cover defence command structure, intelligence, defence finance and defence procurement. Once signed up, the UK loses its ability to negotiate a deal that best suits an independent country. Worse, as a key military power the EU wants our support, but we will have handed it over without gains in other Brexit areas in return. How? It means refusing to even begin discussing UK disengagement from recent defence agreements until after March 2019. Exit talks first, future relationship second. That could take months or years and will keep the UK tied in for the duration of a transition deal, during which the UK will still be a member of the European Defence Agency and applying Common Defence Policy. 4. It hinders our exit from the European Investment Bank, the EU state bank, created to "further EU policy goals"
The new EU policy means linking UK membership of the European Investment Bank (EIB) to defence, making it more difficult to leave the European Investment Bank, which is an organisation closely association with supporting EU policy with considerable UK financial assets but for limited UK gain. How? Since the UK is already part signed up, it feeds future calls for the UK to remain in the EU's centralising military strategy, removing the UK's ability to take independent action in defence and defence procurement to save jobs and expertise. The European Commission's European Defence Action Plan repeatedly asserts the EU's 'strategic autonomy' in defence. "The EU will continue to work closely with its partners, particularly with the United Nations and NATO, while respecting the autonomy of the EU’s decision-making processes." The EEAS's Security and Defence Implementation Plan, as well as the EU Council conclusions from March, May and November 2017, repeatedly refer to the development of EU strategic autonomy in defence. The EU is pursuing four separate funding streams that partly claim authority over member states' national defence budgets and joint financial assets. The decision making over these funds and their conduct will be done within the EU remit, not through NATO. The protagonists of EU defence union have outlined areas in which NATO has not served the objectives of then EU. Ursula Von Der Leyen, German Defence Minister, justified EU defence union by citing NATO 'inability' to intervene in the Western Balkans, Ukraine and Africa. This helps explain why the EU is moving towards developing common pooled EU assets. It already has collective assets such as its Satellite Centre, and a Space Policy to go with it. told the UK Govt it is expected to "play its full role". Denmark, an EU member state plays no part in EU defence because it opted out. The UK should have insisted on the same deal. Diplomats and Ministers thought they were "nurturing good will" by playing along, but that's not how the EU works. It's an acquisitive project that exploits every opportunity behind momentary consensus. The EU Commission has told the UK that because "decisions over EU Defence Union were taken unanimously", the UK is expected to "play its full role while it remains a member". Message: As we are now defence wise, effectively joined up by the hip, thanks to this bounding. Is there a exit clause, a way out or has our idiotic government permanently bound our defence with the EU? Recently the EU revealed the true extent of its confusion about its existence. It published 5 options for its own future and asked for people’s opinions on which way to go. British voters will therefore not know which EU they would have been staying in, until the second half of 2019. Some of these ‘destinations’ would involve massive changes to the EU, and if any of these are chosen it would take decades after that before such a revised or reformed EU could be delivered. 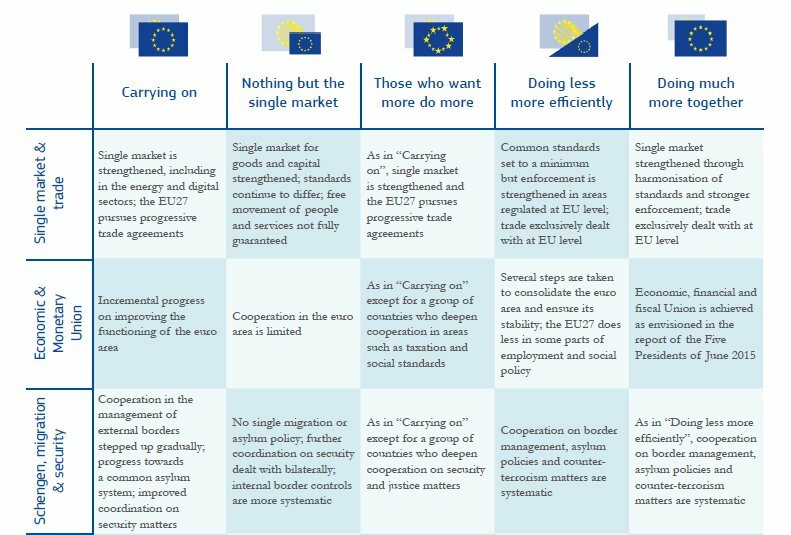 The EU Commission wrote a 32-page White Paper setting out the five types of EU in more detail. You can download this White Paper here. Ah.... We’re sorry but voting isn’t possible as this would involve an exercise in democracy. The EU isn’t that keen on democracy, particularly after the British were allowed to vote in an EU referendum in 2016. So no, voting will not be possible. Instead you can send the EU Commission an email, telling them which version you prefer and why. As a public service, Facts4EU.Org is providing the link to the page where you can tell the EU Commission exactly what you think of their 5 alternative versions of the EU's existence. Please note that despite the form’s initial appearance, you can submit your thoughts anonymously. You are not required to give your name or email address. Here’s the link – now ‘fill yer boots’, as they say. which of the five EUs will we be voting to stay in? [ Sources: EU Commission ] Journalists and politicians can contact us for the full list of links, as usual. Message: What a comedy. Whatever will the 'waste of timers' come up with next? 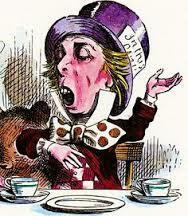 I can just see the EU Bureaucrats coming up with this list of 5, all sitting around the Mad Hatter's tea party, Junker upside down in the teapot seeking alcohol, Barnier the Mad Hatter looking down his aquiline nose at all the rest. 'How many Destinations shall we have?' asks one. Five days later, a decision is made. It will be 5. 'What will our 5 'Destinations' be?' asks another. 'Well, I've always fancied going to Russia,' suggests one hopefully. He gets a biff round the ears. 'We'll have to ask Angie Baby M. We cannot think for ourselves. We have been programmed n o t t o t h i n k.' Snores all round. Meanwhile, with the downfall of Europe, under the heel of the EU Tinpot Jackboot Dictators, will be simultaneous with the rise of Nations in other parts of the World. Will Europe ever rise from its watery grave? I doubt in our life time, if ever. WHEN DID YOU SIGN UP FOR THIS? This is the incredible story of how the UK government has voted 5 times since the Referendum for ever-deeper joint EU defence structures, forces, capabilities, funding, and foreign policy. Before the Referendum, the Remain campaign ridiculed any suggestion that the EU was planning its own EU armed forces. The idea was categorically denied by senior politicians and establishment figures. What is astonishing is how all of this has been achieved without the news being splashed over the British public’s TV screens and over the front pages of newspapers. It has happened without the express approval of Parliament. Not one decision made by the government - and signed up to at the European Council - has been debated and passed in a vote of the House of Commons. In addition, Ministry of Defence officials deny what has been happening. 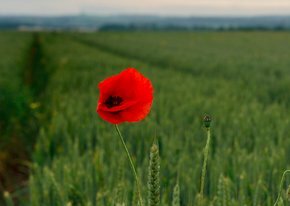 If you thought that the UK’s decision to leave the EU would safeguard the independence of the UK’s military, its defence industry, and its foreign policy, then you may find this series of articles to be compelling reading. We reveal the truth about future defence arrangements - using EU documents, European Council statements and decisions, UK parliamentary research, and MoD statements. The EU’s plans for a combined military date back to its beginnings in the 1950s, when it was part of the initial thinking for a United States of Europe. In December 1998 a bilateral meeting took place in St-Malo between then President Chirac of France and then UK Prime Minister Tony Blair. The resulting declaration indicated for the first time a Franco-British consensus on the evolution of a defence component for the European Union. This in turn led to an agreement at the highest EU level in Cologne the following year. In essence, by the turn of the century EU Member States had agreed to put in place institutional arrangements for the analysis, planning and conduct of military operations. By the beginning of 2007, the EU had two Battle Groups ready to deploy. In the same year, the Lisbon Treaty was signed and it came into force two years later. 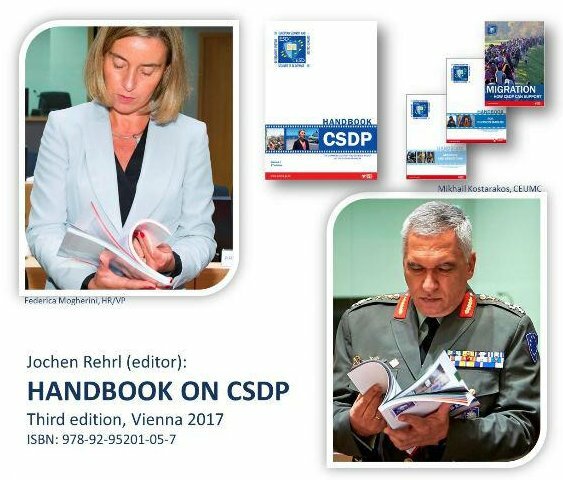 This allowed for the further development of the Common Security and Defence Policy (CSDP), a mutual assistance and a solidarity clause, the creation of a framework for Permanent Structured Cooperation (PESCO), and the creation of the European External Action Service (EEAS). It is the last 12 months which has seen a sudden acceleration in the EU’s defence ambitions. Whilst the World’s attentions were on the result of the UK’s Referendum to leave the European Union, the EU’s Vice-President, Italian former communist Federica Mogherini, has raced ahead with the “EU Global Strategy”. 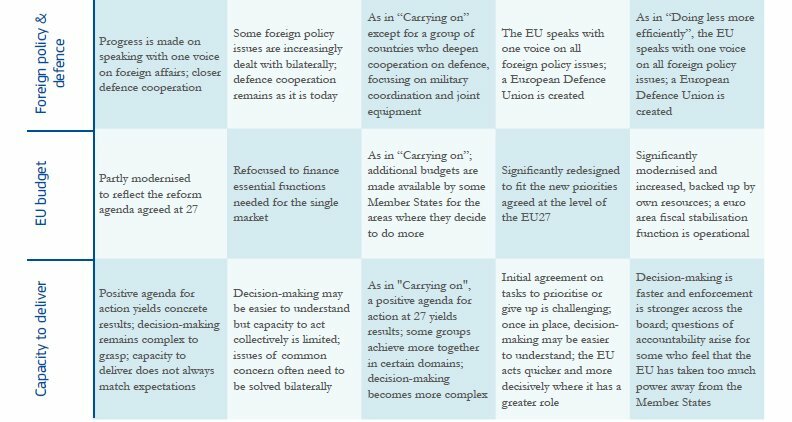 Below we list a summary of five of the EU meetings since the Referendum, at which Theresa May or her ministers were present, and at which key decisions were taken towards the altering of the EU’s nature into that of a united country with its own military. Foreign affairs ministers and defence ministers held a joint session on the implementation plan on security and defence. Green light given to press ahead with deepening EU defence capabilities, new funding arrangements, and many other preparations of a combined EU defence structure. Wide-ranging conclusions adopted by the European Council on defence and security. Serious talk of ‘Permanent Structured Cooperation’ and a ‘European Defence Fund’. 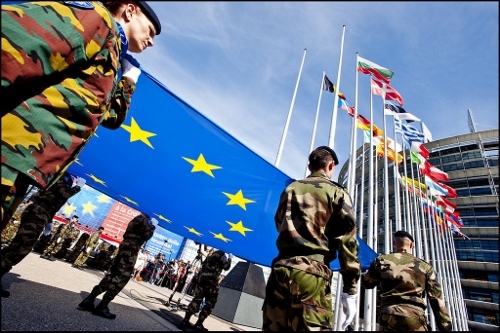 Council conclusions on progress in implementing the EU Global Strategy in the area of Security and Defence, including the establishment of a Military Planning and Conduct Capability (MPCC) within the existing EU Military Staff. EU Global Strategy - Implementation in the area of security and defence. Massive leaps forward across all defence implementation plans, with the EU’s Vice-President talking of EU’s new “ability to act as a security provider worldwide”. 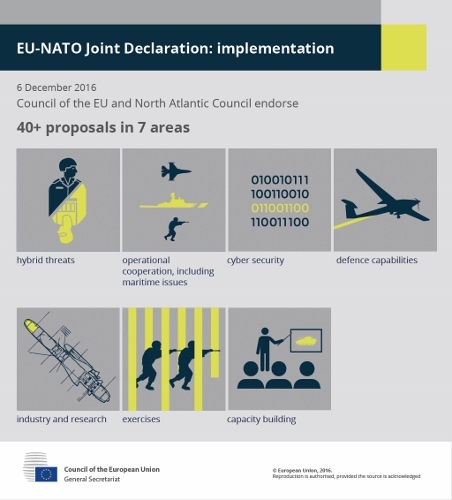 European Council conclusions on security and defence, including the approval of the ‘European Defence Fund’, the ‘European Defence Industrial Development Programme’, and the ‘Permanent Structured Cooperation’ (PESCO) on defence. Crucially, (and we were the first to report this), the Council also agreed that the deployment of EU Battlegroups should be borne as a common cost on a permanent basis. This had previously been resisted by several countries but it was nevertheless approved by Mrs May. We asked campaigning organisation Veterans for Britain if they felt we might be exaggerating the importance of what has been agreed by the UK government at the EU Council meetings in the last 12 months. It is beyond debate that the EU has acted with extraordinary haste since the Referendum, in moving towards a full military capability, with associated funding, and a common foreign policy. Things have moved so fast that even the EU’s high priestess of defence and foreign policy Federica Mogherini has expressed her amazement at being able to get things approved so quickly. “Many believed and told me that it would have proven to be impossible for us to have a first Command Centre in Brussels for our military and training missions or that it would take us years, decades to do it. Note that Ms Mogherini was also surprised at the UK’s acquiescence in all of this. WHAT HAPPENED TO PARLIAMENTARY SCRUTINY? 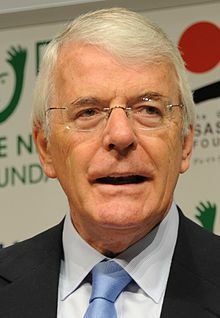 Given the significance of the EU’s moves in terms of its status as an international body, and in terms of the UK’s interests going forward as an independent country, it would be expected that parliament would have been asked for its views prior to the commitments which British ministers have made in EU meetings. On 16 December 2016 the European Scrutiny Committee reported on two letters they had received from government ministers, regarding EU Security and Defence Policy. The letters were from Sir Alan Duncan (Europe Minister) and Sir Michael Fallon (Secretary of State for Defence). Regrettably, no debate has taken place. Even more regrettably, the government has agreed even more serious defence issues in EU Council meetings since then, and yet we have not seen these matters being discussed in the House of Commons. We would go further, having read what Sir Alan Duncan and Sir Michael Fallon told the Committee. We do not recognise their characterisations of the EU Council meetings in question. Our interpretations are based on the formal written conclusions of these EU meetings, as well as the numerous press conferences, question and answer sessions, and interviews which have taken place. Following the last European Council meeting last month, we awaited the Prime Minister’s statement to the House with great interest. Unfortunately, Mrs May did not mention defence at all in her statement – an extraordinary omission given that it had been such an important topic at the meeting. 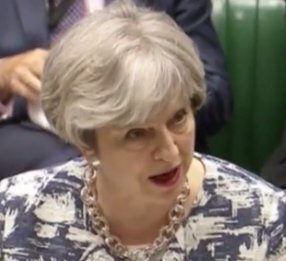 The PM later referenced defence very briefly in response to two questions by MPs. However she didn't state what had been agreed at the meeting, nor its implications. Introducing her first reply with "the European Council did touch on defence issues as well" is hardly giving clear information to Parliament about the substantive issues discussed, nor the decisions made. We invite readers to compare Mrs May's statement to the House of Commons, with the formal Conclusions of the European Summit. Tomorrow, we look at how NATO's role is changing, as well as some other very disturbing factors in this grab by the EU for hard military power. In the meantime, do you have any comments on our articles so far? Message: Both defence ministers are Remainers of course. The MOD emailed its civil servants before the referendum telling them to vote to remain. Their decision to join in the legal attack on servicemen using false evidence, resulting in the expulsion of Mr.Shiner, should have been unforgivable. But here they still are, selling us down the river. It will be interesting to see whether the EU spends 2% on defence now. Let's hope Pres Trump is handed a print of your excellent exposé. Message: In [a previous] article you state: “What happens if no agreement is reached? The EU Treaties simply cease to apply to the UK two years after notification.” Would it not, therefore, be the case that any Defence treaties 'would cease to apply to the UK two years after notification'? Perhaps signing up, for now, to these Defence treaties is an inducement to the EU Barnier to agree to the terms set out by the UK Government on a Brexit? Whatever the motives, our Prime Minister Theresa May will at some stage soon face up to scrutiny by Parliament and the people of Britain, now that these Defence issues are in the open. Reply: In fact the answer to your question is complicated when it comes to defence. When we get time we'll write an article explaining it. 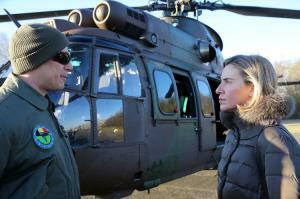 Federica Mogherini and Jens Stoltenberg are true and passionate believers in the EU ‘project’. This would not necessarily be a problem if they weren’t also the biggest players in the fast-changing landscape of European defence. The one on the left runs EU Defence & Foreign Policy. The one on the right runs NATO. Both individuals are responsible for dramatic changes in the way European defence is being handled. It is highly unlikely that the man or woman on the proverbial Clapham omnibus could put a name to her, but Federica Mogherini is the most powerful woman in the whole of the EU’s massive bureaucracy. She studied political science in Italy and France and did her dissertation on Islam. She spent the first eight years of her political life as a member of the Italian Communist Youth Federation and only changed to become a member of the Youth Left when the Italian Communist Party dissolved. She has only ever worked in politics. No friend of the UK, Ms Mogherini has said she’s looking forward to ‘having the file’ on Brexit as soon as the UK becomes what the EU refers to as ‘a third country’. Third countries instantly come under Ms Mogherini’s vast umbrella of job titles. She is High Representative of the European Union for Foreign Affairs and Security Policy, Vice-President of the European Commission, and Head of the European External Action Service. As such, she will be in overall charge of the EU’s relationship with the UK. 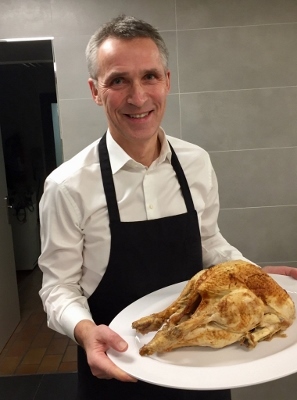 Jens Stoltenberg is a Norwegian who started his political life following a revolutionary Communist group called Red Youth. Later, for 4 years he was the leader of the Workers' Youth League, before eventually rising to become a minister in Norway’s Labour government. 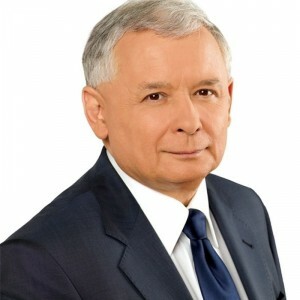 He was Prime Minister from 2000-2001 and from 2005-2013. A fervent Europhile, he twice campaigned – unsuccessfully - for Norway to join the EU. “The arrangement [Norway] now has with the European Union is that we pay a huge amount of money to the European Union. We implement EU decisions and directives, but we don’t have a say. We are not at the table,” he said. We find it deeply disturbing that the defence of the continent of Europe is being shaped by two individuals like this. Both former Communists, both fervent supporters of the EU project. There is something very disturbing about the thousands of pages on the EU’s website which refer in some way to the work of the EU’s External Action Service. It is hard to find a page without at least one photo of Ms Mogherini. For an unelected person, who has never been subject to a popular vote in the EU, she seems to be very keen to promote herself. Either that or the EU is now engaging in the cult of personality. Try it for yourself and see if it unsettles you as much as it does us. With regard to Mr Stoltenberg, we found his behaviour last year wholly unacceptable for someone in his position and we felt that he should have resigned (or been fired) after his disgraceful attempt to influence the Referendum result in the UK. Putting that to one side, we feel that his passionate europhilia makes him a unsuitable person to be involved in discussions with the EU over its massive defence ambitions. The discussions between NATO and the EU are fundamental to the security of half a billion people and it is clear to us that they are not being scrutinised as they should be by NATO. We have only read and listened to bubbling enthusiasm from Mr Stoltenberg whenever the EU’s plans are mentioned, and this is simply not an appropriate response. To our readers who are MPs and MEPs, we would suggest that a very high degree of cynicism is used when looking at the current work of the EU in relation to defence matters, and also to anything said by Mr Stoltenberg when commenting on the EU’s plans. The EU is clearly engaged in a grab for military power, no matter how it might pretend otherwise. The even more worrying part is that the UK is seemingly in agreement with absolutely everything that the EU and NATO are planning. To read our output from 01-15 July, simply click here.